As higher education admissions and enrollment continue to evolve, colleges and universities are digging deep to differentiate themselves. More than ever, prospective students (and others involved in their school decision) are spending time researching and comparing the value they’ll receive from their educational experience. Higher education leaders are charged with the task of increasing enrollments and improving students’ experience while keeping tuition costs down. Is this even possible? We’ve proven it’s possible to develop and deliver a learning curriculum and experience to admissions and enrollment professionals in both private and public colleges and universities. We’ve done this by adapting our flagship sales methodology, Value Based Selling, to fit the ethos and culture of higher education. This is the same methodology that over 5,500 sales and marketing professionals from pedigreed, Fortune 50 companies like IBM, 3M, and GE have completed for over 20 years. 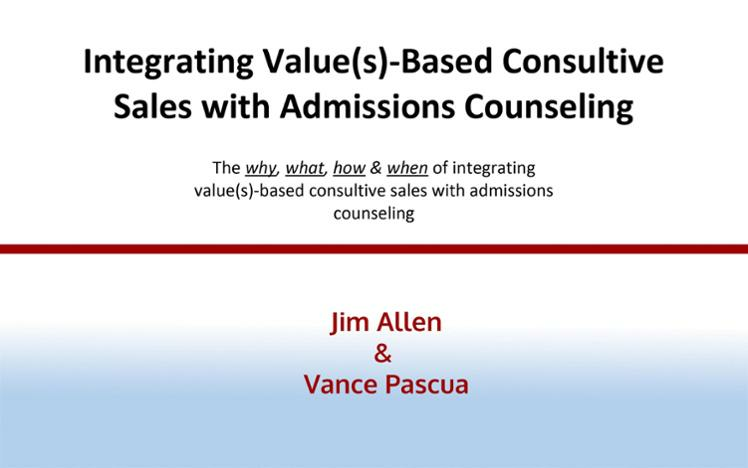 When schools integrate value(s)-based, consultive sales practices with admissions counseling, their yield can increase substantially. One school that’s made this kind of investment is George Fox University (GFU), located just outside Portland, OR. GFU deployed a training program for their Admissions Counselors on how to use value(s)-based, consultive sales practices to increase their “bottom of the funnel” proficiency rates and yield. Since training their Admissions staff in 2013, GFU has experienced four record-breaking freshman classes. Better still, they’ve accomplished this with fewer applications through an increase in marketing efficiency. The 2013 training engagement occurred three years after GFU’s first engagement when the school trained over 30 staff members representing their Undergraduate, Graduate, Adult Degree Completion and Advancement staffs. We’ve recorded four record breaking freshman classes in 2013, 2014, 2015 and 2016 since completing the Value(s) Based Enrollment Methodology. Those of us that had the privilege of completing the Value(s) Based Enrollment Methodology training continue to use key elements from the training to more effectively serve prospective students and Messiah College. We are more aware of the importance of sales training and have included much of the course in our enrollment and new Counselor hiring processes. By the way, our funnel numbers are healthy.